If you have a fabulous idea for your next tattoo, you will love our friendly tattoo team at Euro Tat! Art, more specifically body art, is something personal and unique and as individual as each person who collects it. At Euro Tat, we are dedicated to providing our clients with art that appeals to their style and personality. At our tattoo studio, we have tattooed celebrities and have gained popularity as a top destination for those who want amazing quality tattoos. 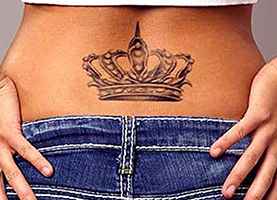 You can be confident that when you choose Euro Tat as your number one tattoo shop in Rockford, IL you will never be disappointed. We have a great team of artists who offer a variety in styles and techniques, which makes to create something for everyone. You may be someone who wants something petite and feminine or you may prefer something bold and daring on your body. We are here to please you, our customers, and we will ensure that you get what you want. 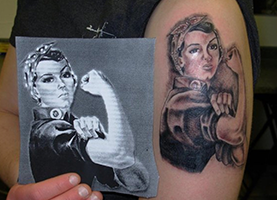 When choosing a tattoo, you want to find the artist that can provide you with the style that you are looking for. Our wonderful artists have portfolios available for your viewing pleasure, so that you can choose the one who will understand the design you want. We understand that a tattoo is a relatively life-long decision, and that is why we take the time to ensure that you are happy with the results. We also provide safe and sterile piercings at our studio. As a licensed and top studio in Rockford, IL, you need not worry about infection or disease. Our body painting is another great attraction at Euro Tat, and when you see our portfolio, you will see why. Get in touch with us today to set up an appointment, and roll with the pros!